This summer is one of work, and fun for Noble Goods. 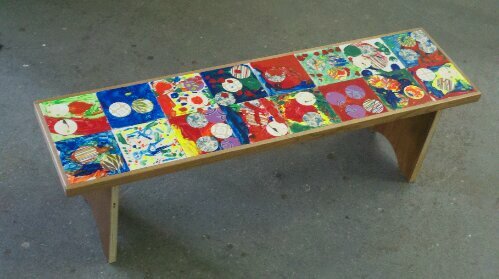 The colorful pics show a bench that we built for our son’s school. The project was this: build a simple, easily understood bench with sixteen, white wooden tiles for the top. Next, deliver the bench and simply discuss its design in a way that three-year-olds can grasp (these kids are very perceptive!) 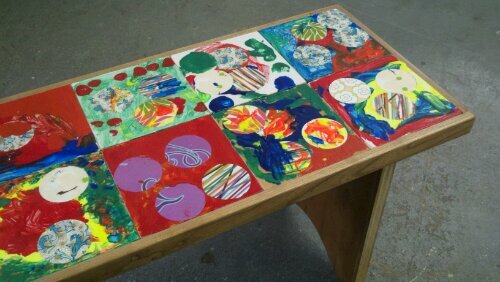 Then we passed out the tiles and Molly set them up with paint and collage supplies. Later, back at the shop, I glued everything together and gave it four coats of a water-based varnish for durability ( juice+sand = scratched up furniture). I think the kids will enjoy this for years to come, and both Molly and I really loved creating with them. I hope that we always find the time to embrace the wild, spontaneous energy that comes with children’s creativity. It is an energy unfiltered, and unrestrained by our decades of experience. Love it.